Exploring the mulch-rich forest beds under the slopes of the Simonsberg Mountains at Delheim estate in Stellenbosch, visitors are led on a mushroom hunt with local experts. 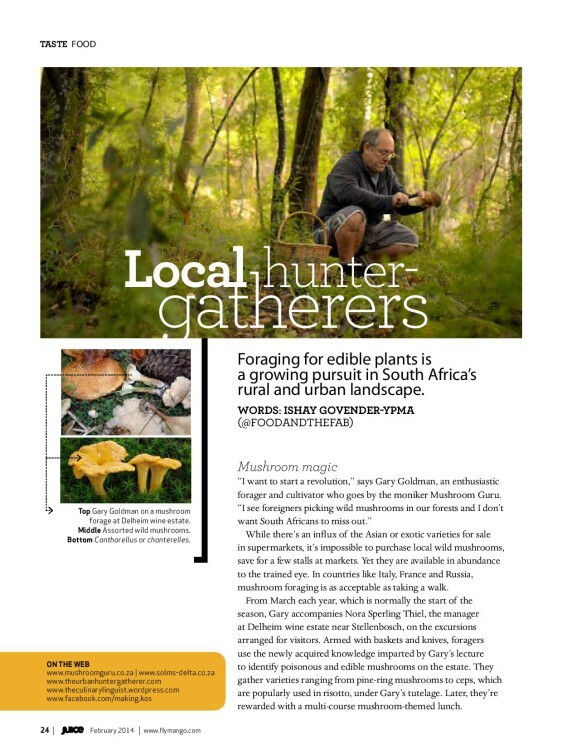 Foraging for food, edible plants specifically, is an exciting and growing pursuit in the rural and urban landscape in South Africa. From March each year, normally the start of the season, Goldman accompanies Nora Sperling Thiel, manager at Delheim estate, herself is an avid mushroom forager, on excursions arranged for visitors. 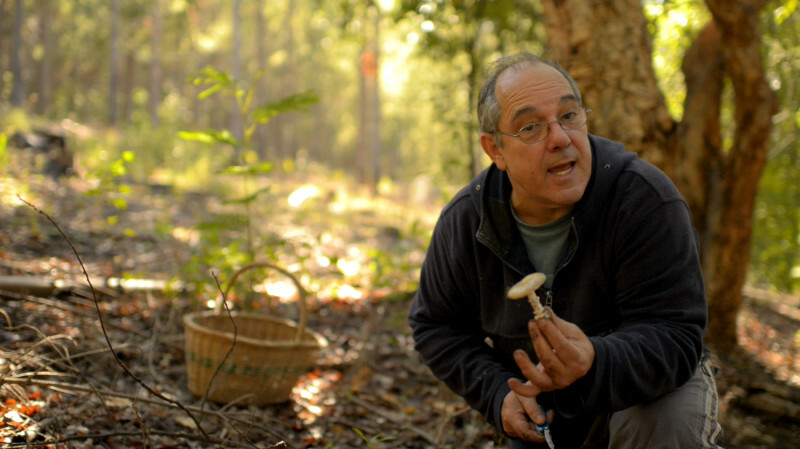 Dressed in denims and sturdy walking shoes, armed with baskets and knives, the foragers use the knowledge imparted by Goldman’s lecture to identify poisonous and edible mushroom on the estate. 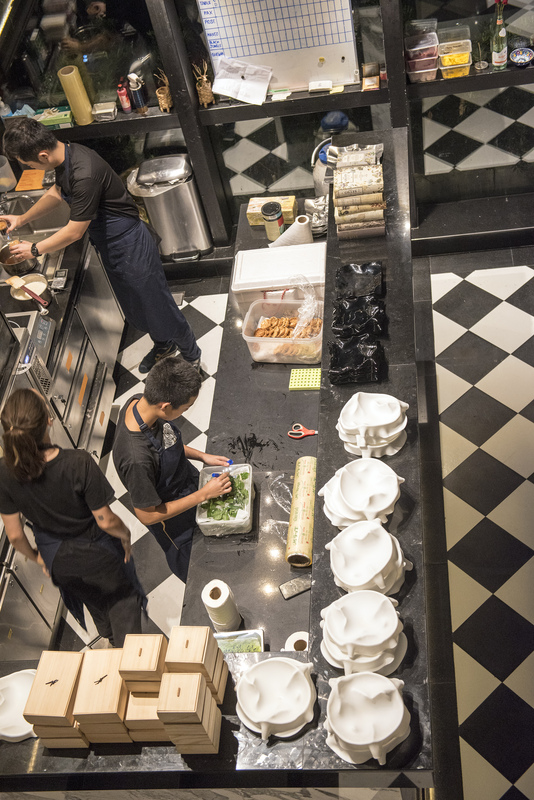 From pine-ring mushrooms to ceps, which are popularly used in risotto, the foragers gather mushrooms under Goldman’s tutelage, to be rewarded later with a multi-course mushroom themed lunch. Whereas Thiel picked up the basics from her mother, Goldman is mostly self-taught. “When I started foraging for mushrooms, I could not find a mushroom expert to ask what was edible and what wasn’t. So, I taught myself. After several years of identifying mushrooms from my collection of books, I can now identify them with confidence,” says Goldman who assists people with identification through his website, Mushroom Guru. While there is an influx of Asian or ‘exotic’ mushrooms for sale in supermarkets, it is impossible to purchase local wild mushrooms, save for a few market stalls. Yet, they are available in abundance to the trained eye. In countries like Italy, France and Russia, mushroom foraging is as acceptable as taking a walk. 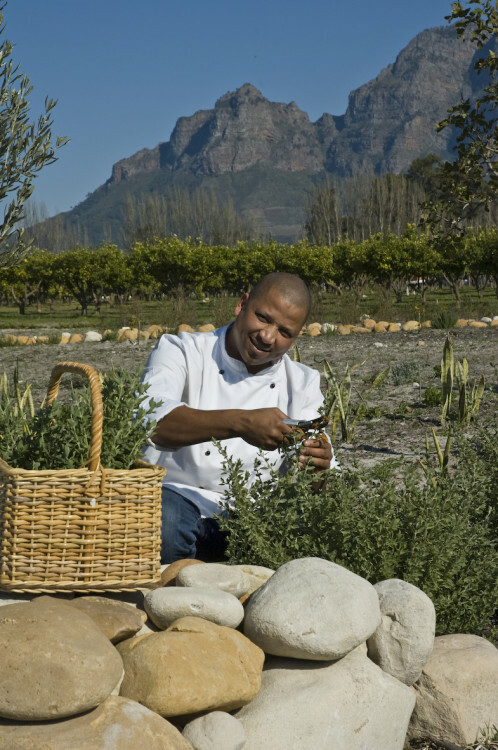 Chef Shaun Schoeman runs Fyndraai restaurant at Solms Delta outside Franschhoek. 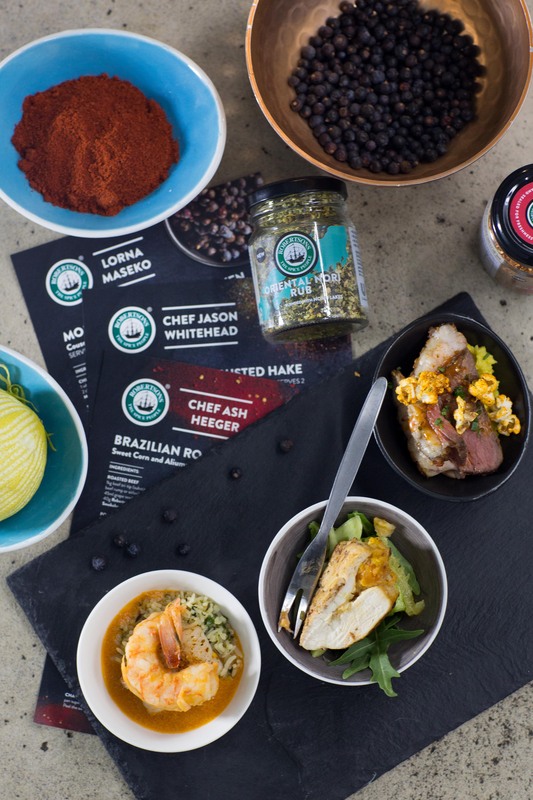 One of their aims is to reinstate the importance of foods foraged by the Khoe, known collectively today as the Khoisan, who are Schoeman’s forebears. The author of the book Koekemakranka, Coetzee studied over many years the food ways and habits of the Khoisan and assisted Solms Delta in cultivating an essential sustainable garden with many of the long-forgotten and endangered indigenous herbs, roots, melons and flowers. 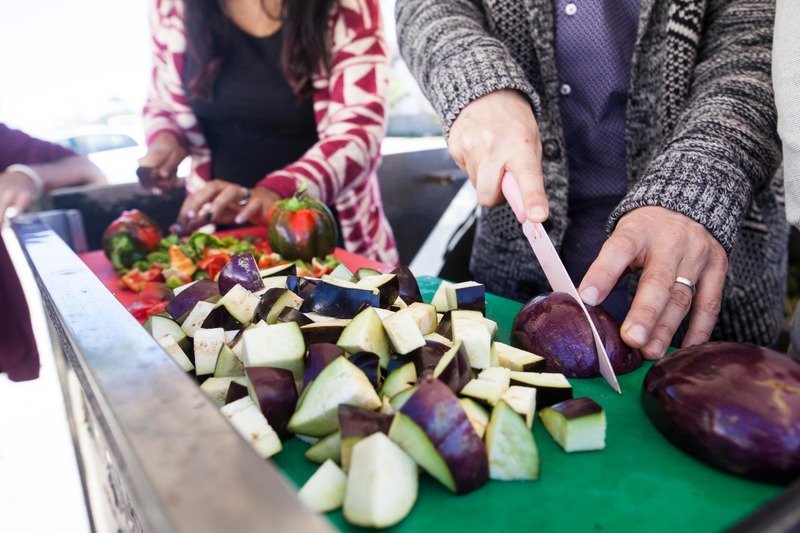 This educational kitchen garden is open to visitors of the estate. In embarking on this project, Coetzee effectively prompted Schoeman to reconnect with his own estranged roots. 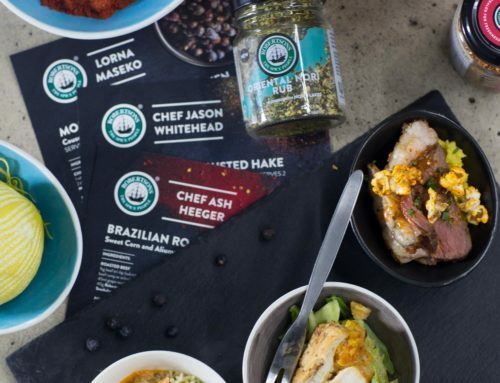 “Now I am an enthusiastic believer in the importance of veldfood, and convinced that food can unite cultures and help South Africans not only to understand each other better, but also to take pride in their heritage, “ he says. 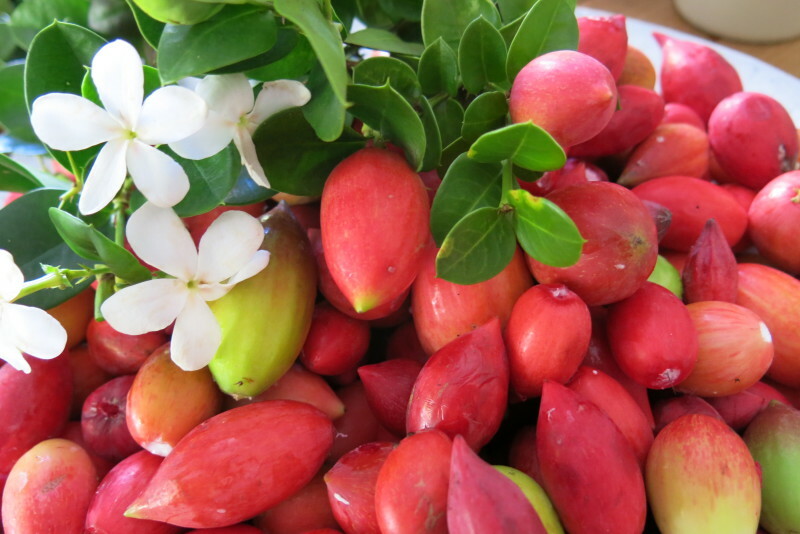 Visitors to Fyndraai can enjoy dishes that contain buchu with its citrus aroma and flavourful leaves, wild garlic, t’samma and makataan melons, num-nums (Natal wild plums) and the striking perfumed koekemakranka that bears a solitary white and yellow flower and blooms for two days, once every year. 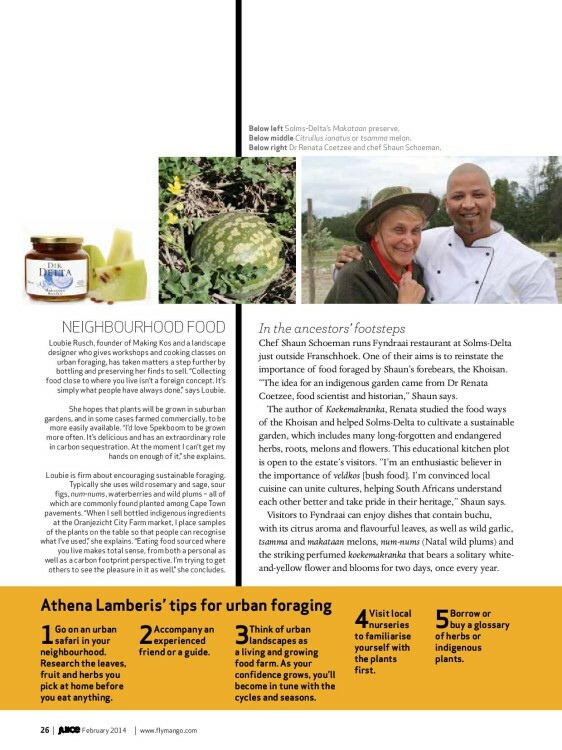 Foraging in its true sense has needed a helping hand in the case of indigenous Khoisan plants, but without this cultivated garden, we may have lost an important cultural culinary component of South African heritage. Charles Standing is holding onto the edge of a fence over a busy road, as he gathers red num-nums. No stranger to a bit of a thrill, Standing, a stunt coordinator, has channeled his years of foraging into a cookbook by the name of the Urban Hunter Gatherer. Born to a Greek family in Chicago in the United States, Athena Lamberis spent her childhood picking dandelion, crab apples and mulberries with her mother. She moved to South Africa in 2008 and was overwhelmed by the glut of untapped urban edibles. 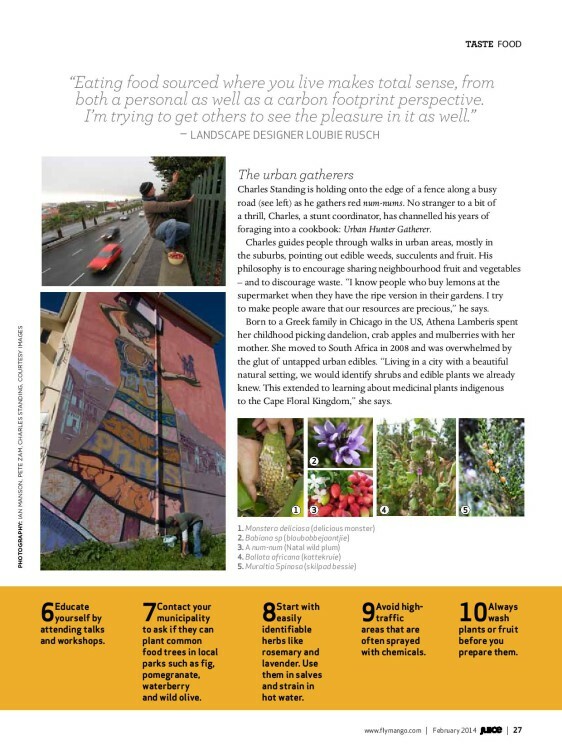 “Living in a city with a beautiful natural setting, we would identify shrubs and edible plants we already knew. 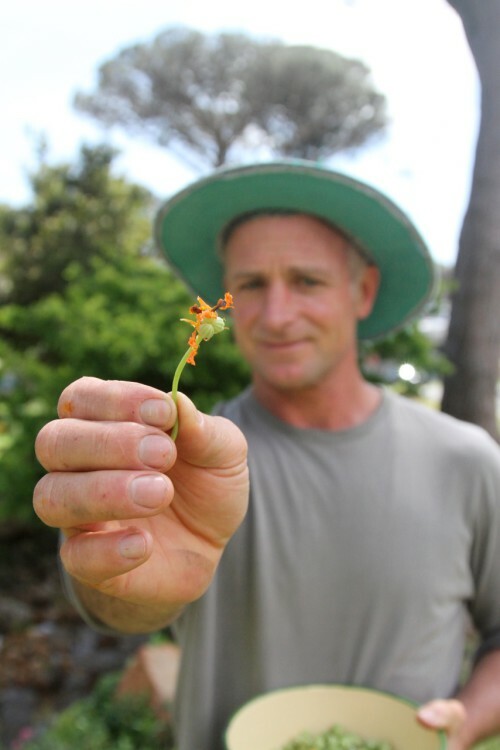 This extended to learning about medicinal plants indigenous to the Cape Floral Kingdom,” she says. 1. Go on an ‘urban safari’ in your neighborhood. Research the leaves, fruit and herbs you pick at home before you eat anything. 2. 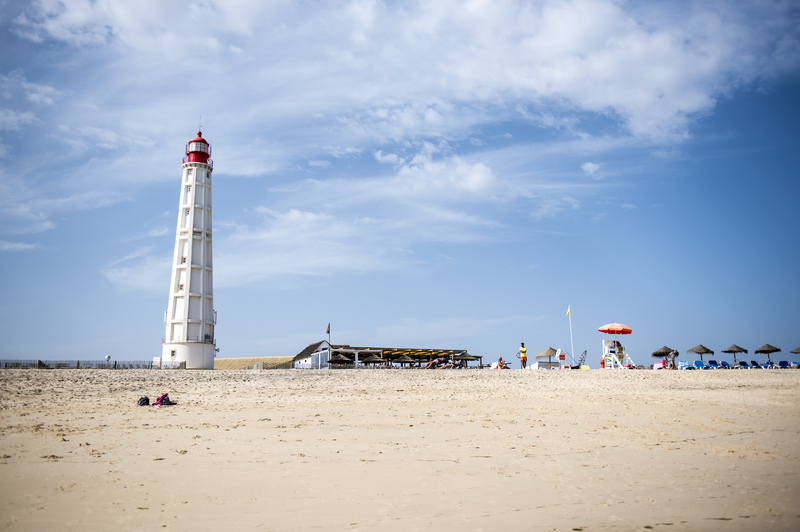 Accompany an experienced friend or guide. 3. Think of urban landscapes as a living and growing food farm. As your confidence grows, you’ll become in tune with the cycles and seasons. 4. Visit local nurseries to familiarise yourself with the plants, in order to aid identification. 5. Borrow or buy a glossary of herbs or indigenous plants. 6. Educated yourself by attending talks and workshops. 7. Contact your municipality to plant common food trees in local parks such as fig, pomegranate, waterberry, and wild olive. 8. Start with easily identifiable herbs like rosemary and lavender. Use them in salves and strain in hot water. 10. Always wash plants/fruits before you prepare them. Loubie Rusch of Making Kos, a long-time landscape designer who leads workshops and cooking classes on urban foraging, has taken matters a step further by bottling and preserving her finds for sale. “Collecting food close to where you live isn’t a foreign concept. 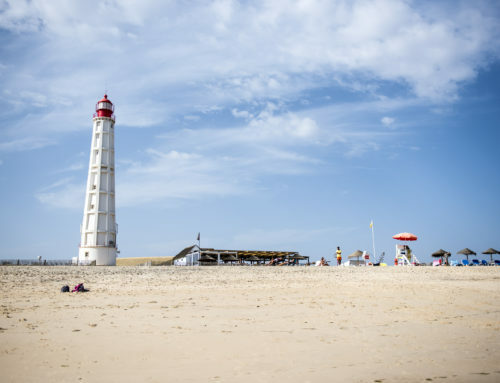 It’s simply what people have always done,” says Rusch. She hopes that some plants will be grown in suburban gardens, and in some cases farmed commercially, to be more easily available in the mainstream. “Spekboom is a wonderplant I would be glad to see far more commonly grown, because it is delicious and for the extraordinary role it can play in carbon sequestration – at the moment I can’t get my hands on enough of it,” she explains. 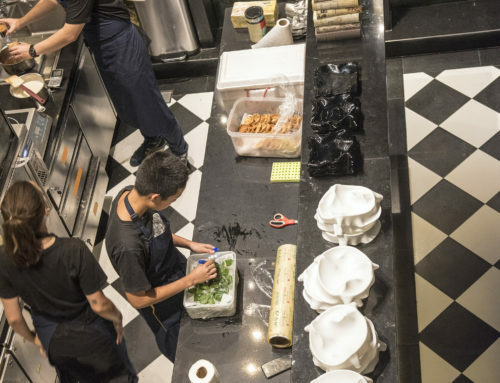 Reluctant to broadcast about slower growing or more rare edible plants, or about consuming too many plant roots, Rusch is firm about encouraging sustainable foraging. 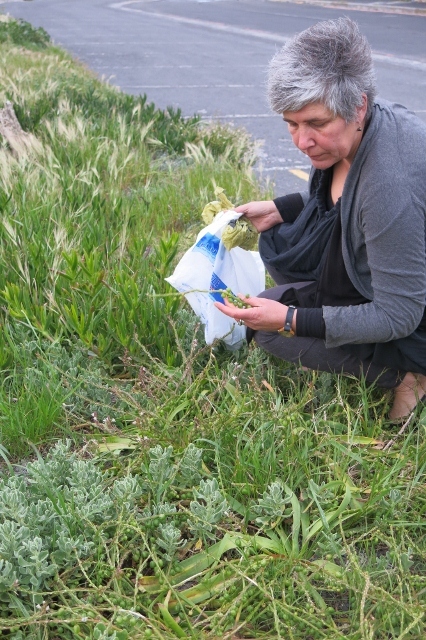 Typically Rusch uses wild rosemary and sage, sour figs, num-num fruit, waterberries, and wild plums – all of which are commonly found planted on Cape Town pavements. “When I sell bottled indigenous ingredients at the Oranjezicht City Farm market, I place samples of the plants on the table so that people can recognise what I have used, “ she explains. 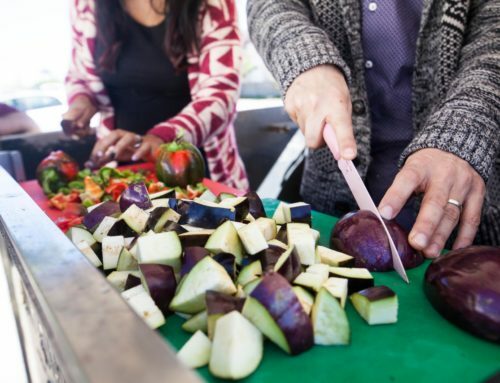 “It is so obvious to me that eating food which comes from where you live makes total sense, from both a personal health as well as a carbon footprint perspective. 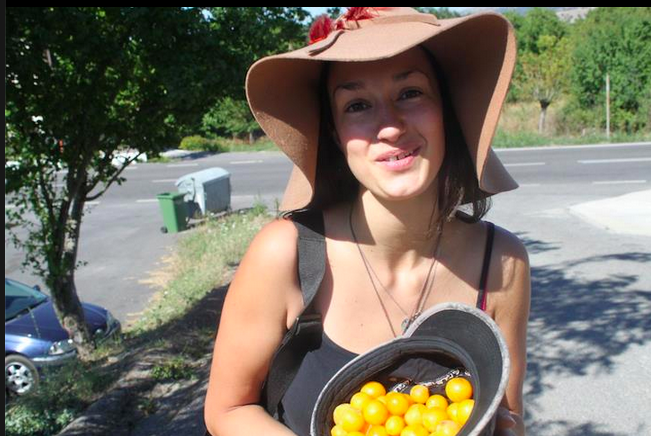 I am trying to get others to see the pleasure in it as well,” says Rusch, a message shared by her compatriot foragers, both urban and rural. I need your help in foraging. It’s something i’ve never done ) but something I am now so keen to get involved in. However, I’ve got no idea of where to start….???? Could you be in touch and direct me to the first step? Hi there. I’m not sure if can assist you – but have emailed you with some details. Good luck! This is a wonderful idea and a great article. I want to join a foraging group, but are still looking. Can you please email me information about groups in Somerset West and Strand?